PATERSON – It’s a warm summer day and CUMAC’s van pulls up to the corner of North 1st and Arch Street in Paterson. A handful of clients stand outside, eagerly awaiting the mobile pantry’s arrival. The CUMAC team is greeted with warm smiles and hellos. Jeni, Marvin, and Isaiah begin unloading their equipment and get to work. 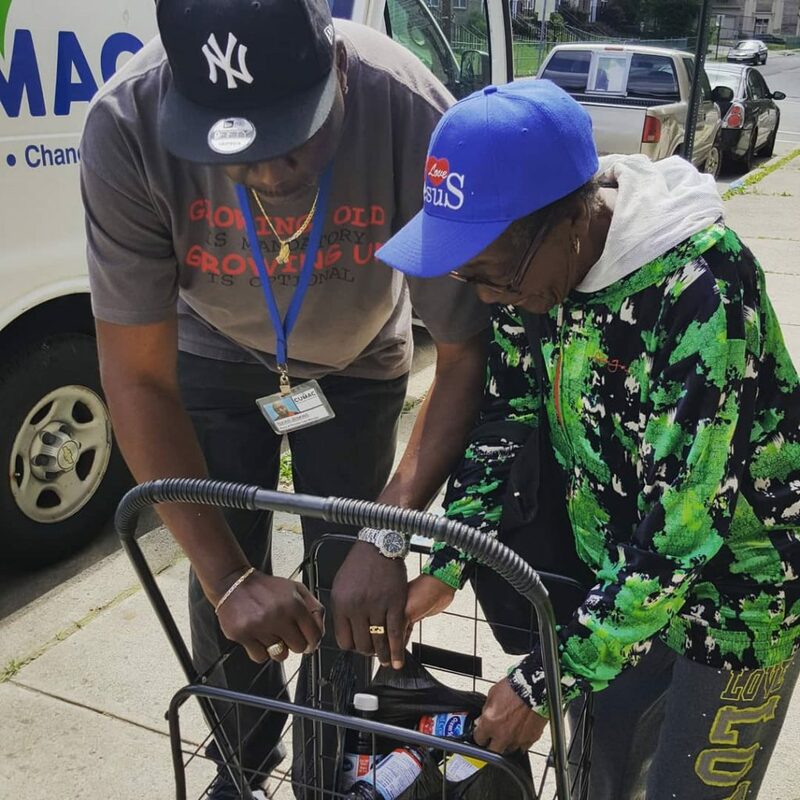 Every Wednesday one can find CUMAC’s mobile pantry on the north side of Paterson. It’s part of CUMAC’s ongoing efforts to reach underserved populations and ensure that none of their neighbors go hungry. For many residents in the north side of the city, transportation is limited and that makes accessing community resources a huge challenge. Having services brought directly to their neighbors provides them with some much-needed relief. “This is a real blessing. I don’t know what I’d do without CUMAC,” says one of the regular clients as he waits to pick up his groceries. The CUMAC team starts to process his paperwork, but it feels more like friends catching up. They talk about their lives and share stories while Jeni types away at the computer. The client talks about his recent trip to the hospital while CUMAC’s team carefully listens and offers encouragement. Fortunately, he’s fully recovered and feeling much better. After a few minutes of chatting, he thanks the team one last time, picks up his food, and goes on his way. As the morning goes on, clients filter in and out. Jeni and Marvin handle the intake process while Isaiah stands ready by the CUMAC van, distributing groceries. Isaiah loves making clients smile, and he can be heard cracking jokes and finding ways to brighten a person’s day. Between jokes, he carefully helps an elderly woman load her shopping cart, which she walks over from a senior residence down the street. Isaiah looks down the road as she crosses the street toward her apartment. She’s got a big smile on her face and a cart full of groceries to take home. She won’t have to worry about going hungry this month because there are people around her that care. “That’s what being part of a community is all about, isn’t it?” Isaiah said. CUMAC is one of GNJ’s Hope Centers. More information about CUMAC can be found here.